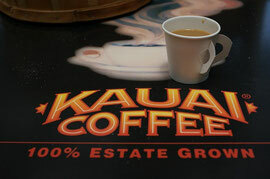 Opens from 9:00- 5:00 p.m.
Kauai Coffee Company Gift Shop is one of my favorite places on Kaua'i because I can taste some coffee for free. How generous they are! 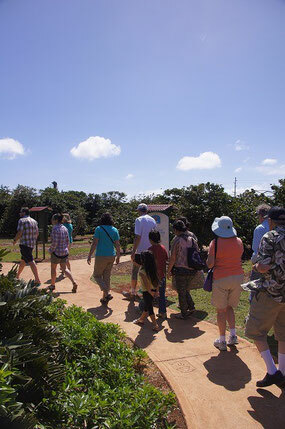 They provide not only free sample of coffee, but also chocolate and they offer free guided tour every day for any visitors. Last month, I went to this gift shop two times and this month, I went there three times for the guests, including my mother-in-law, yesterday. Every time I visited there, I was actually surprised to see many people. I came to have an impression that more and more people are coming to this small gift shop. I wonder why... Is this because the local company, Alexander & Baldwin (“A&B”) has sold its coffee operations to the major coffee company Massimo Zanetti ? If that is so, what is the secret? There must be some secrets that they have gotten much more visitors nowadays. While staying there, I was thinking the reasons.... why this small gift shop seemed to be successful. This time I was able to find an answer! 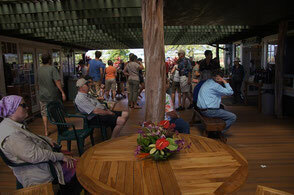 Kauai Coffee Company Gift shop is so popular because coffee is so good, of course. But it's also because they always give free hot coffee! Not like cold drink, it takes time to drink hot coffee! It means the customers have to stay longer there around the shop to complete drinking hot coffee. The longer they stay, the more money they might spend! 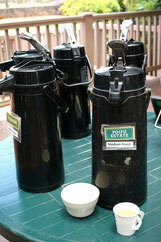 In fact we tasted free coffee, joined free guided tour, but because we stayed longer, we ate expensive hotdogs there. I thought free coffee must be a good deal for the shop. At the same time, I recalled one of my most favorite proverbs, "If you always give, you will always have." I think this Chinese proverb is very true at the Big Island Candies, too, since they always give free sample candies and hot coffee to the customers. 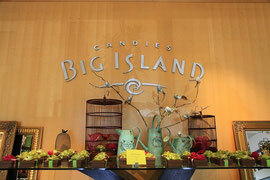 When I visited there last May, I was very impressed not only by their generosity, but also the numbers of customers. They were coming one after another. This is just like this sayinig! Because they always give, they always have customers. Now I think our temple should always give "something" and then our temple can have more visitors and hopefully new members! What do you think is "Something"? Is that Sushi? Dharma Talk? Youtube videos? flickr photos? I don't know the exact answer but all I have to do is I will try everything I can give! I will appreciate your support. 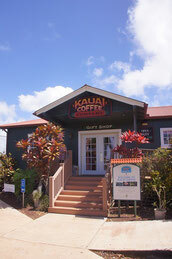 Kauai Coffee Company Guided walking tours are available at 10am, 1pm and 3pm every day. It's good to know about cofffee!